Inside EasySendy Drip (or EasySendy Pro) you can import all of your email lists from (your) ex MailChimp account within single click. For this you have add your MailChimp account API key and get started to import the subscribers from the MailChimp account. 1. Once clicking on profile name on right-hand side top, you see a menu option as below. Click on “MailChimp Subscriber Import” link. 2. On clicking MailChimp Subscriber Import link below screen appears. Click “Create New” on below screen. 3. Below screen opens, where you can enter API Key of your MailChimp account. 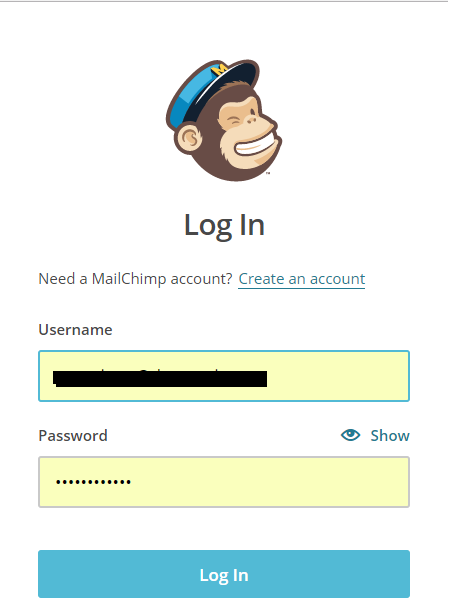 Enter MailChimp API Key and click save button. 4. Below few screens help you in finding MailChimp API Key if already generated, else you can also generate new keys from the same screen flows. Log in to MailChimp Account. 5. Once login to MailChimp account, click on your profile name at right-hand side top corner. Click Account link from the menu appeared. It opens account overview page with various sub menus as shown in next image. 6. On account overview details page, click on “Extras” sub menu item. From the menu, links appeared to click on API Keys. 7. On clicking of API Keys, below screen opens. In this page, you can enable/disable existing keys. And also generate new keys. Copy API Key value and put in create for of EasySendy Drip (or EasySendy Pro) as explained above. 8. On below screen, you can enter API keys and save data. 9. On saving MailChimp API Key, below screen appears. Click on button highlighted to see all the lists that are there in your MailChimp account. 10. From below screen select list that you wish to sync/import subscribers to EasySendy Pro. 11. Click on “OK” dialogue box to complete the action. 12. Once above action completes, you will see your MailChimp subscribers imported into your EasySendy Drip (or EasySendy Pro) account within 1 hour to 12 hours of time depending upon your list size. You can visit “Lists” page to see your imported list and subscribers.